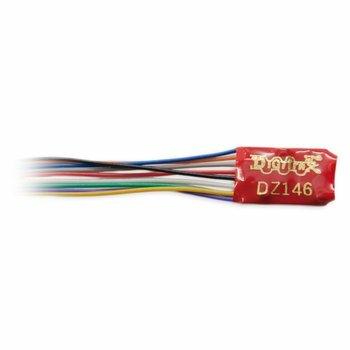 DZ146 1 Amp Z / N / HO Scale Wired Mobile Decoder Wired Motor & Function Decoder that fits many N and HO Scale Locos. Size: .55” x .4” x .148” 14mm x 10.23mm x 3.77mm Z/N/HO Scale 1.0 Amp/1.5 Amps Peak 4 FX3 Functions, 0.5 Amp FX3 Function outputs for prototypical lighting effects and on/off control: Constant Brightness Lighting with directional or independent control. Optimized selectable LED or incandescent lamp operation Realistic Effects like Ditch lights, Mars lights, strobes, and many more Configurable Pulse Function available on all function outputs. FX3 & Standard Function Qualifiers operate functions based on direction, F0 on or off, direction and F0, and whether loco is moving. Function Mapping for custom function setup. Master Light Switch turns off all lights & functions with one keystroke. Advanced Consist Function Controls. Digitrax LocoMotion® System-Your locomotives look like the real thing. The Digitrax LocoMotion System makes them run like the real thing, too! Scaleable Speed Stabilization (Back EMF) with simple setup & 256 level resolution. Torque Compensation. 128 Speed Step operation (14 or 28 steps can also be used). Momentum with acceleration and deceleration. Normal Direction of Travel is user selectable. Switching Speed feature for easier and faster access to yard speeds. 3 Step Speed Tables set start, mid and max voltage for custom control. 28 Step Speed Tables with 256 level resolution for precise control. Program CVs using any Digitrax Compatible Control system without havingto buy any extra equipment. 2 Digit and 4 Digit Addressing. Basic, Advanced & UniVersal Consisting. SuperSonic motor drive for silent operation. Direct mode programming. Decoder Reset CV with or without speed table reset. Transponder Equipped ready for transponding on your Layout. Motor Isolation Protection helps prevent damage to your decoder. 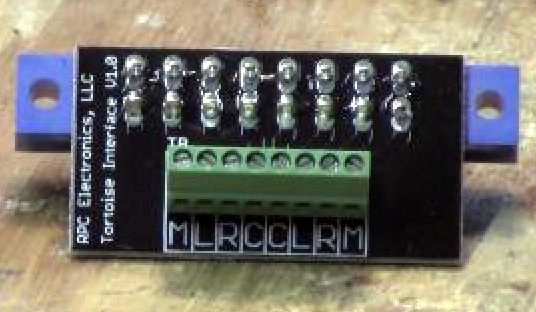 Automatic Analog Mode Conversion when running on DC layout. Decoder Lock for individual programming of multiple decoders in one loco.